Stage 10 saw Marcel Kittel take his second victory of the Tour as he came from behind to pip Andre Greipel on the line. Mark Cavendish was a distant third and received more attention for his role in a crash as the sprinters approached the final bend. Stage 11 is the first individual time trial of the race so far and should see some more shake-ups in the general classification. In terms of the actual stage, it is 33km long, starting in Avranches. 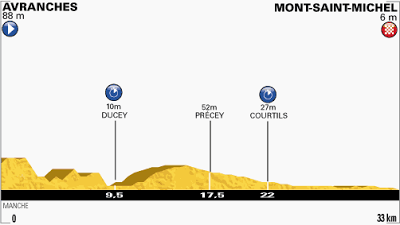 While it is not perfectly flat, the very small climbs and descents shouldn't really have much of an impact, so we are looking at the big power riders in the peloton when it comes to finding the winner of this stage. There is one standout favourite for this stage - the two-time time trial world champion, Tony Martin. In the absence of Fabian Cancellara and Bradley Wiggins, it is tough to really see anyone challenging the German for the stage win here. While he was involved in a nasty crash in Stage 1, he proved that there were no issues as he put in a mammoth shift for his team in the team time-trial to almost power them to victory. To be honest, anything other than a Tony Martin win would be a huge upset and he is the shortest priced favourite of this race so far at a top price of just 8/15. So, really we are looking at the men that are likely to finish behind him. The first obvious candidate is the yellow jersey of Chris Froome. He has looked supremely confident so far, both in leaving all his challengers in his wake in Stage 8, then individually closing down any attacks in Stage 9. A bronze medal in the Olympic time-trial event last year showed his ability and he has finished in the top 7 in every time-trial this year. He will almost certainly extend his lead at the top of the classification, but I am not convinced that he can beat Tony Martin, particularly after those tough mountain stages. Omega Pharma Quick-Step showed their time-trialling ability earlier in the race and it was not simply down to Tony Martin. In Michal Kwiatkowski and Sylvain Chavanel, they have two more riders that will certainly be challenging for a place in the top 5, and possibly even on the podium. The Pole has been in sparkling form so far in this Tour and will be looking for his sixth top 4 result. Orica GreenEdge were the surprise winners of the team time-trial earlier in the race and this was much helped by a magnificent performance by the big Canadian, Svein Tuft. He is a former silver medalist in the World Championships time-trial and he has already won two time-trials this season, albeit not against the very best riders. However, morale in the team is sky-high and Tuft will be eyeing up a podium place. While Movistar will be hoping that Alejandro Valverde and Nairo Quintana can limit their losses to Froome, they will also be hoping for a good showing from Jonathan Castroviejo, who has four top-5 time-trial results already this season, including the Spanish championships. While it would be a major shock if he were to win it, a top-5 place is certainly within his grasp. Other possible contenders for the top 5 might include Team Sky's Richie Porte, Orica GreenEdge's Cameron Meyer, Vacansoleil's Lieuwe Westra and BMC's Tejay van Garderen, who will be desperately trying to find any positive to take from this Tour. With such a strong favourite, it is tough to find many appealing bets. However, as much as I believe Tony Martin will win, there are enough things that could go wrong to avoid taking him at the current price. We will take just the one in the outright and will hopefully focus more on some of the match bets.